An apple a day won’t keep PARASITE away! When I first arrived at Orbit earlier this year the first book I read was PARASITE (US | UK | AUS) by New York Times bestselling author Mira Grant. Even though I’d been a huge admirer of her Newsflesh series I was not fully prepared for how it would affect me. One notable influence was that it added the unlikely element of paranoid thrills to a customarily mundane process: signing up for healthcare. Your health is too important to trust to just anyone. Thankfully their services were not on offer, but the machinations of this novel’s medical corporation and the plight of Sally got inside my head with a riveting blend of creepy suspense, complex characters, and a terrifyingly believable look at science gone extremely wrong. 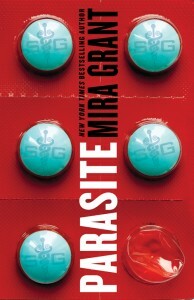 Parasite, the first book in Mira Grant’s Parasitology series, is out today and you should not miss out. PARASITE is out now in hardcover and ebook. For more about the book, visit symbogen.net or follow @SymboGenCorp on Twitter, and check here to see all the book tour dates.